If you’re a lover of all things angst, have I got a book for you! The Last Thing He Needs is high drama from the start. At a time when he should be living the high life and enjoying his 20s, MC Tommy is struggling to rise above a really awful, stressful situation wherein he’s the primary caregiver for his seven (7!) younger siblings. Tommy’s parents are junkies and are mostly checked out of their lives. The family is fighting to stay off of the radar of the police and family services while trying desperately to stay clothed, put food on the table and avoid committing too many petty crimes. Whew. It’s enough to make anybody want to throw in the towel, but Tommy’s hanging in there. He’s got a seriously hard time trusting others, though, and forget him asking for help from anybody, like, ever. Pride is the bitterest pill, right? MC Bobby knew Tommy back in high school. 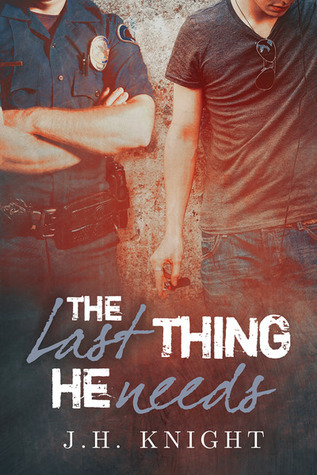 He’s a cop now, and he’s run across Tommy’s family more than once, whether dealing with Tommy’s deadbeat parents or trying to keep the younger kids out of trouble. Bobby starts coming around more than is wanted OR needed, but it turns out that’d because he’s interested in Tommy. This was my second book by J.H. Knight, and I must say, I really like the way she crafts a story. The characters—from main to supporting—are fully developed, thoughtful and interesting. They might feel gritty, but that makes them real in my mind, genuine. I liked the chemistry between the Tommy and Bobby. The push and pull of their relationship was frustrating, and I wanted Tommy to stop being so stinking stubborn and harsh. It bugged me when it felt like he was being gratuitously mean to his parents, and I cringed when he used colorful language around the kiddies, but like I said, gritty and real. At the end of the day, it worked. I mentioned the angst? There are two particularly big events that send the angst-o-meter straight through the roof, but I liked how those things were woven into the plot. Just finished this one yesterday, it was such a fun, awesome read and yes the cover is perfect! This entry was posted on August 7, 2014 by Jenni in Contemporary, Cops / Cowboys / Military, Reviewer: Jenni and tagged 3.5 Stars, Dreamspinner Press, J.H. Knight.